IN PRAISE OF THE BEAST, 2009, Single channel HD Video, 14 min. 58 sec. The work begins with a cake sitting in the middle of a forest, decorated in celebration of the beasts that live out in the wild. These celebrated beasts, however, do not understand that the cake is food, let alone its celebratory intent. The wild boars that emerge stamp on the cake and destroy it, and begin to roll all over it as though they are playing in mud. Some viewers may think these boars are ugly and monstrous, and others may think they are rather cute. Wild beasts are portrayed in many fables and other stories as representations of the ugly and chaotic. But to these beasts that actually live out in the wild, such images made by humans bear no relevance. In fact, the humans who presented them with the cake can be said to be arrogant. Humans are supposed to be animals, no different from these wild boars, yet we have burdened ourselves with a host of problems, such as the destruction of nature and environmental pollution caused by mass consumption. Is it truly the beasts who are barbaric, or is it we? The work poses us viewers with this question through the image of the wild boars innocently frolicking in the cake. Born 1977 in the historic city of Pamplona, located in northern Spain. Graduated from the Polytechnic University of Valencia with a degree in Fine Arts in 2001. MA in Photography at the Royal College of Art in London, 2011. Lives and works in London. Alfaro questions the true nature of order and ethics, with religion and native mythology or fables among her primary motifs. 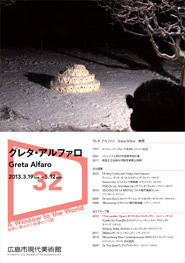 Her works are presented in a variety of different forms, such as photographs, video, and installations. Selected for participation in Bloomberg New Contemporaries 2010 and awarded with a grant from the Genesis Foundation that funded her 2012 solo exhibition A Very Crafty and Tricky Contrivance (London), Alfaro is among the leading artists of her generation.